Ideally this would mean that areas of the screen at the top would trigger the spot light, and areas at the bottom would trigger the lightstrip. However, by creating a simple test pattern on the screen with the top half as yellow and the bottom half as blue, you can see that Philips Hue Sync makes both lights the same colour. 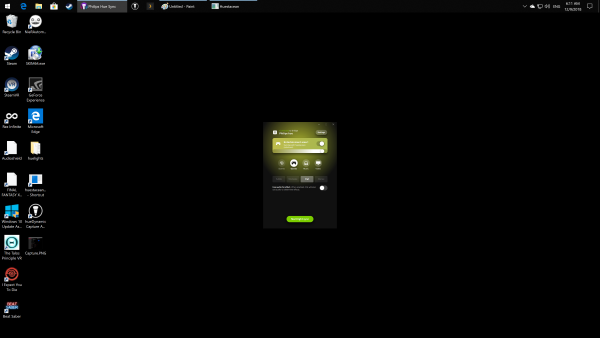 It uses the CPU to sample from the screen instead of the GPU. CPU usage is unnecessarily high as a result. By comparison, the open source Heustacean app has none of these issues. 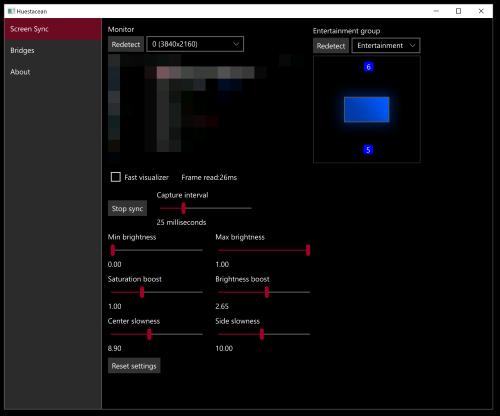 It’s a fast C++ program that samples from the GPU, respects high DPI screens and most importantly correctly samples vertically. Let’s hope Philips can fix the issues with Hue Sync as it is an amazing idea. Playing Rez Infinite is fantastic with the additional lighting effects. 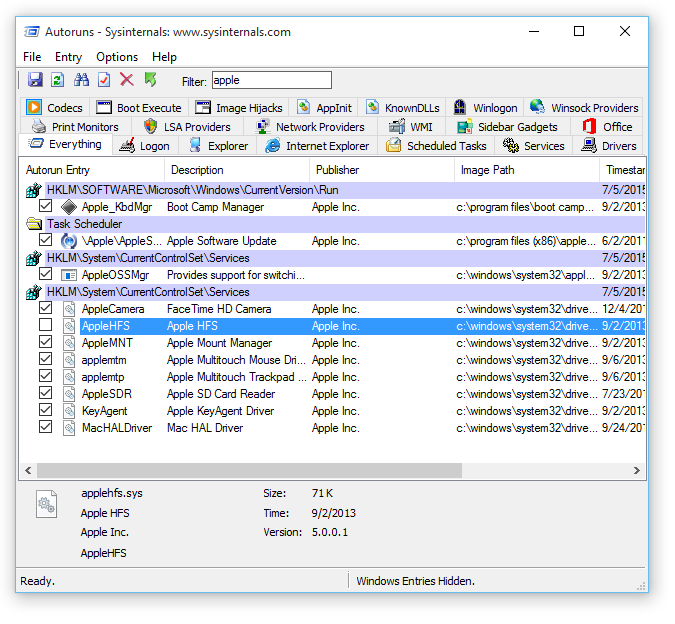 In a post three years ago, I waxed lyrical about how much better Parallels Desktop was compared to VMWare for the very common task of running Windows on your Mac. Parallels Desktop is no longer fit for purpose if you are an advanced user. In older versions of macOS, virtual desktops spanned your whole set of monitors. Therefore if you had a left and right monitor, switching spaces (or virtual desktops) would switch both, giving you two “Desktops”, Desktop 1 (left monitor A and right monitor A) and “Desktop 2”, (left monitor B and right monitor B). Switching between desktops would switch both screens. The major downside of this was that when applications were run “Full screen” (rather than just maximised), they would go full screen on one monitor and leave the other one completely blank, which was complete madness. In Parallels 11, Parallels supported two ways of rendering full screen on multiple monitors. The first was using macOS’s built in full screen function (more on that in a minute) and the other using a “non-native” method that involved drawing a windowless fullscreen window on top of the whole screen. To work around the full screen issue when using multiple monitors, macOS Yosemite introduced the option for displays to have their own “Spaces”. This meant that your left and right monitors have their own sets of virtual desktops. However, this meant that each monitor could be switched desktop independently, introducing say 4 different combinations when you had two monitors and two desktops. This was a context switching nightmare. 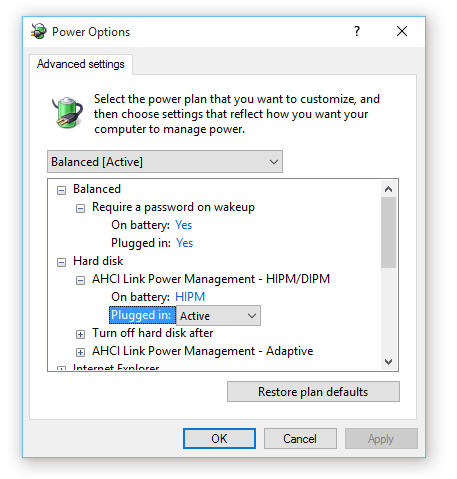 Most power users turn this off, especially if they are using keyboard shortcuts (CTRL+arrow keys) to switch between spaces because the monitor that would switch would be the one your mouse cursor was over. The combination of turning off “Displays have separate Spaces” in macOS, and disabling “native full screen mode” in Parallels was the perfect, wanted behaviour that Parallels users of multiple monitors had become accustomed to for many, many years. Parallels 12 changed all that, by removing the non-native full screen mode option that was working perfectly in version 11, leaving users with no satisfactory multi-monitor display mode. Did Parallels listen? Well, only a little. Near the end of version 12’s shelf life they pushed an update out that contained a work around – an option to “switch” all other spaces to Parallels when you clicked Parallels on another space. Sounds great but still doesn’t allow you to switch in and out of Windows on all of your screens at once. Users were livid. The pithy Knowledge Base article didn’t help either. Then Parallels 13 came out with no new fixes for this. Parallels was effectively dead for users with multiple monitors. The push for yearly subscription pricing. You aren’t Creative Cloud guys. The last thing users want when buying a piece of utility software is to set calendar reminders that they are going to be auto-rebilled. The shovelware and crapware that Parallels pushes on you, even via advertisements with the application that you paid for. Who doesn’t want a subscription to Parallels Remote Access or “Parallels Toolbox”? Only 9.99 USD a year!! Back in the day, Parallels spanked VMWare Fusion on performance. They became market leaders and deserved it. I fondly remember running Parallels 4 against a Bootcamp partition on a now clunky old Mac Mini and being pleasantly surprised. It works correctly with multiple monitors! Yes, VMWare Fusion 8.5 behaves the same way Parallels 11 used to work. Running Windows 10 Anniversary Edition? Click this link and say yes to the prompts (You’ll, er, have to press CTRL+ALT+DELETE to exit and sign in again). …will launch the app. Administrators can even create user accounts that are locked down to single web pages where CTRL+ALT+DELETE is the only way out. I wonder how long until this gets abused. Shameless plug: This post was written with Net Writer – a little app I wrote to help blogging on Windows 10. If you have Windows 10, download it for free. 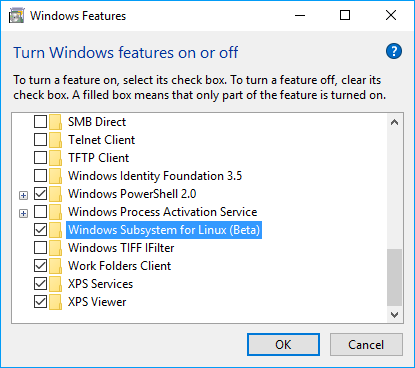 One fantastic new feature in the latest version of Windows 10 is an add on you can install that allows you to use an Ubuntu-based Linux distribution natively in Windows. This opens up a whole new world for developers on Windows, including access to the same class of Git and SSH tools that are available on OS X (goodbye PuTTY!). To enable it, start by heading to Settings, Update & security, For developers and turn Developer mode on. Then, right click on the Start icon, click Programs & Features, “Turn Windows features on or off” and enable “Windows Subsystem for Linux (beta)”. You’ll need to then restart your machine. Once back, open a new admin command by right clicking Start and choosing “Command Prompt (Admin)”. Then type “bash” and hit enter. You’ll need to set some things up – including choosing a new username and password for the Linux install – then an Ubuntu image will download from the Windows Store. You’ll then be dumped into a bash prompt that will be familiar if you have used a Terminal on OS X. The first thing you should do is run “sudo apt-get update”. This will update most components of the Ubuntu install. You can now use Ubuntu’s version of Git, instead of the Windows version you likely have installed. To install it, open a bash command and type “sudo apt-get install git”. 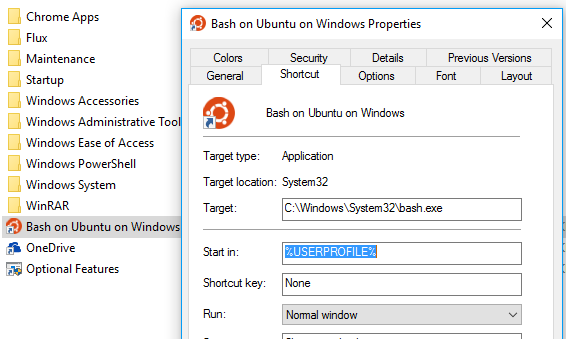 By default, the “Bash on Ubuntu on Windows” shortcut opens a bash prompt in the user directory of the Ubuntu install. This isn’t very useful if you still need to interoperate with files in your main user directory. 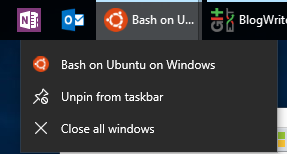 To fix this, start by right clicking on the “Bash on Ubuntu on Windows” shortcut in the Start menu, going to More and Open file location. You can then right click on the shortcut and choose Properties. Delete the tilde ~ character from the end of “Target”, enter %USERPROFILE% in the “Start in” box and hit OK.
Clicking the shortcut will now open in your Windows user profile folder via the magic of the mount points set up. Simply right click the icon in the taskbar and pin it to get a shiny new Unix-based command line on Windows without Cygwin or MINGW32. Magic! It is increasingly looking like the Surface 3 is going to be discontinued. Microsoft is running out of stock on the 128GB / 4GB RAM model. Third party vendors are heavily discounting it, suggesting a clearance. The biggest sign of its demise is that Intel are simply going to stop making the quad-core Cherry Trail Atom processors that power the Surface 3 and other tablets like it. This is a crying shame. The Surface 3 (not to be confused with the larger, laptop-class Surface Pro 3) is simply a fantastic tablet device. Surface 3 was the successor to the Surface 2, which followed on from the Surface RT. Both Surface RT and Surface 2 were powered by ARM chips and a limited, cut down version of Windows, Windows 8.1 RT. They were never eligible for an upgrade to Windows 10 (although the work done to enable Windows-on-ARM lives on in Windows 10 IoT). The market also shunned them and customers were confused by them. I was in New York for the launch of Surface RT, picked one up and loved it. I however personally witnessed customers, after queuing for an hour to get into the pop-up Microsoft Store in Times Square, decide to leave empty handed when they found out that the Surface RT wouldn’t run iTunes. Strangely the Surface Pro, which would have run iTunes, had its release staggered to a few days after the RT launch. I believe this caused significant confusion and prevented the Microsoft Store staff from successfully upselling. Surface RT was a fantastic device for its time, albeit with serious flaws. I loved the fact it was a perfect Remote Desktop machine, but aspects like the custom charger and stupid 16:9 aspect ratio took until the Surface 3 to resolve. Mini USB charging port – you can charge this thing with almost any cable or charger you already have lying around, including USB charging battery packs. This makes it extremely easy to travel with. The Surface 3 is the only Surface (including RTs and Pros) ever made with a standard, universal charging connector. Stylus support – one of the USPs of the Surface Pro VS the Surface RT was the fact the Pro had a Wacom stylus and digitizer. It took until the Surface 3 for the non-Pro line to get a stylus to match the Pro line. Although you do need to buy the pen separately, the pens are the same across Surface 3 and Pro (which has a pen bundled). I have a feeling this might have cannibalized sales of the Surface Pro 3 and 4. USB 3 port – Pretty much peripheral ever made for a PC works with the Surface 3. DisplayPort connector – you can plug directly into a large monitor with dual screen support. Kickstand – this is unbelievably useful on airplanes and something that Apple is too proud to add to the iPad without resorting to flappy, folding cases. Without the keyboard attached this enables hands-free viewing in a really small footprint. Expandable storage – you can bung a micro SD card in the slot in the back to expand the storage. None of the above features are available on non-Pro iPads without accessories and dongles. Stylus support is limited to the iPad Pro. Battery Saver mode – this really works. It shuts down background processes (even Windows Updates!) and underclocks the CPU. I have seen the Surface 3 stretch to around 10 hours of use when browsing with Battery Saver turned on. InstantGo/Connected Standby – Surface 3 picks up emails and Skype calls when in standby mode. It does actually work. Real Chrome – because this is a real PC, you can run full Chrome with extensions. Hilariously, Chrome had better support for tablets than Microsoft Edge until the Anniversary Update – Chrome supported swipe left/right for back/forward when Edge did not. iPads are limited to a fake Chrome (Safari in a wrapper) with no extension support. Legacy software – Microsoft Money still works on this, a program Microsoft stopped supporting in 2008. Native support for FLAC and MKV – one of my favourite features of Windows 10 is built in support for FLAC, the most popular lossless audio encoding format, and MKV, the most popular HD video format container. Apple still does not have native support for these in macOS or iOS. Multiple user accounts – unlike an iPad, you can actually have multiple user accounts with separate settings etc. You can create user accounts for your spouse and children without the ability to administer the device. I believe Apple’s solution to shared devices is to, er, buy another one. The only real downside is because of the slow eMMC disk speed, Windows 10 baseline version updates can take over 2 hours to install. I own the second model, purchased at the Hawaii Microsoft Store for 599 USD, along with a US layout type cover at 129 USD and a stylus at 49 USD. This was a total of 540 GBP at the time, so thanks to the exchange rate I essentially got the type cover for free. If you want to buy an iPad with 128GB storage, this will cost you 619 GBP for the 9.7 inch iPad Pro. The iPad Air only goes up to 64GB for 429 GBP. You still don’t get a kickstand, expandable storage or even a USB port. iOS doesn’t even support a mouse, Bluetooth or not, forcing you to get gorilla arm when using it with a keyboard attached. At under 500 quid, this is a feasible device to travel with and not have your holiday ruined if you lose it. I cannot find any justification to get a Surface Pro 4 at double the price for the mid-range i5 / 8 GB RAM / 256 GB storage model. After using a 13 inch MacBook Pro as my main machine for three years, I’ve now offloaded the Mac and returned to the state of having a beefy desktop and cheap, portable companion tablet PC. I was sorely tempted by the Surface Book, but for the two thirds of the price you can build a beast desktop and get a Surface 3 or other companion device for portability, just using Remote Desktop if you need to connect back to base. For those who don’t mind Windows and want a companion device, I really recommend getting a Surface 3 whilst you still can. They were/are truly revolutionary at their price point. A few months ago I started to write a replacement for Windows Live Writer for Windows 10 using the new Universal Windows Platform, calling it Net Writer and putting it on the Windows Store in Preview. 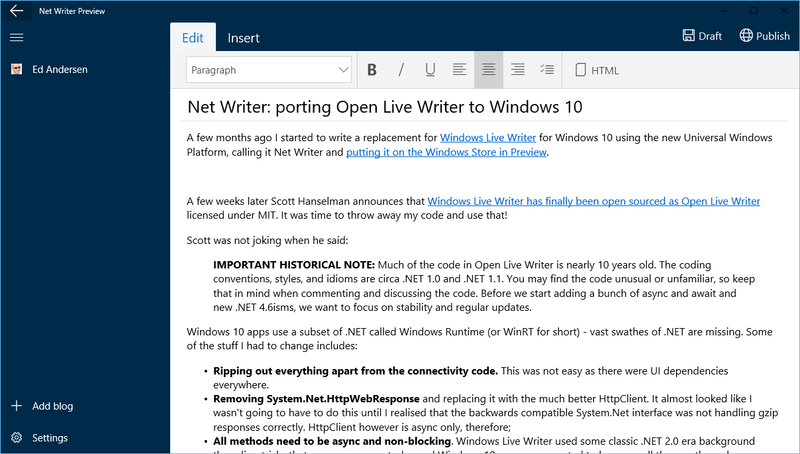 A few weeks later Scott Hanselman announces that Windows Live Writer has finally been open sourced as Open Live Writer licensed under MIT. It was time to throw away my code and use that! IMPORTANT HISTORICAL NOTE: Much of the code in Open Live Writer is nearly 10 years old. The coding conventions, styles, and idioms are circa .NET 1.0 and .NET 1.1. You may find the code unusual or unfamiliar, so keep that in mind when commenting and discussing the code. Before we start adding a bunch of async and await and new .NET 4.6isms, we want to focus on stability and regular updates. Ripping out everything apart from the connectivity code. This was not easy as there were UI dependencies everywhere. All methods need to be async and non-blocking. Windows Live Writer used some classic .NET 2.0 era background threading tricks that are unnecessary today and Windows 10 apps are expected to be async all the way through. The XML API has changed quite a bit and now wraps around what I assume is a C++ implementation underneath. System.Xml has been replaced with Windows.Data.Xml.Dom. There is a bizarre new way of querying with XML Namespaces that StackOverflow saved my bacon on. It took days of staring at 1000+ compiler errors but I managed to get a subset of Open Live Writer working. Net Writer currently only supports WordPress blogs (like this one) but I will be gradually turning on the other supported blog engines as I test them out. This also means that Open Live Writer code now works on Mobile – however the user interface is a bit of a hack job at the moment. You can try Net Writer out for free from the Windows Store. I update the Preview when time allows and love getting feedback. Great news! 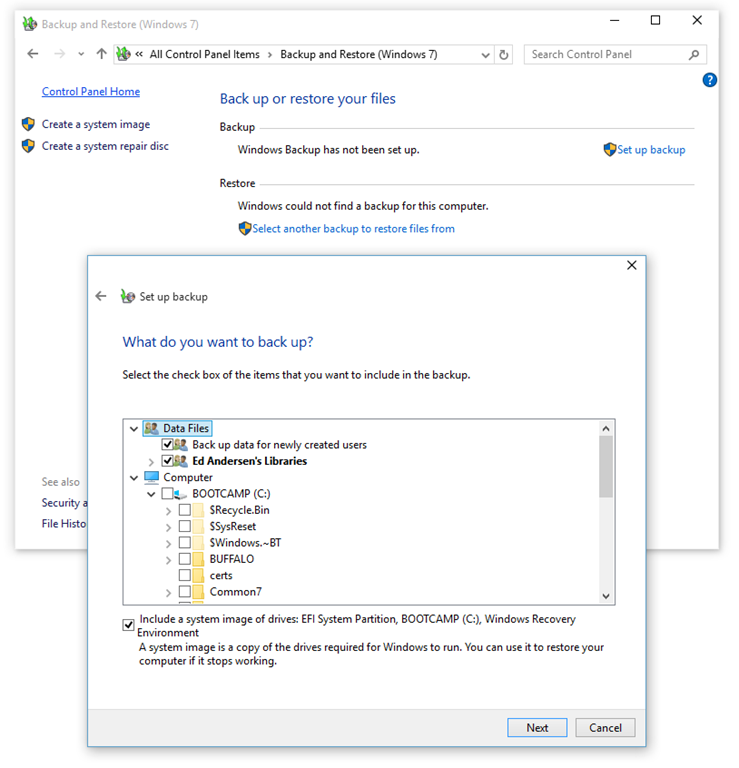 In Windows 10 build 10130, Microsoft appears to have seen sense and brought back the perfectly functional Backup and Restore function that was removed in Windows 8.1. You can find it in the classic Control Panel under “Backup and Restore (Windows 7)”. No longer do you have to use the File History feature. 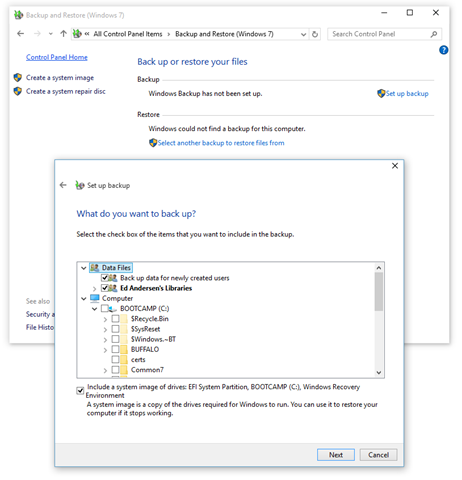 The Windows 7 version of Backup and Restore supports a schedule you control, all files on your hard disk, includes a System Image at the same time and will include your OneDrive files! The cynic in me suspects this is only here for the benefit of Windows 7 users who have upgraded directly to 10, skipping Windows 8 and 8.1, rather than an admission that Windows was suddenly without a viable backup solution (which File History is not). Back in 2011, I created a pretty popular post (that now redirects here) that contained the WEP key for Softbank’s “mobilepoint” wifi hotspot on the Shinkansen. For some reason, both docomo and Softbank encrypt their public wifi connections with publicly accessible keys which doesn’t prevent eavesdropping on connections at all. Docomo even sells “visitor” access passes via their mobile portal, only accessible if you know the wifi password in the first place! Once in, you can then log in with your roaming provider (I use Boingo, which works a treat in Japan, and is the source of the above info). The best “public” wifi provider in Japan is Wi2 if a hotspot is available – they provide a hotspot that doesn’t require a password and sells passes in English on the portal.